Harry C. “Buddy” Melges is a sailing legend. He didn’t learn it from a book, and he didn’t learn it from going to school. He’s self-taught, though he had plenty of help from his father. He has a professorial quality, the way he describes the complexities of sailing – angles, boat mechanics, design – much like a surgeon would explain his craft. And his memory is a steel trap: he can perfectly describe the weather conditions the first time he set sail 80 years ago, just as easily as he could tell you what he had for dinner last night. There’s a good reason why he’s called the “Wizard of Zenda,” a reference to the unincorporated community in Walworth County where his family’s business has long been based. Melges is arguably one of the most successful and competitive sailors in history, having earned more than 120 national and international championships in a number of classes, including conventional sailing and ice boating. He won Olympic bronze in 1964 (Flying Dutchman class) and the gold in 1972 (Soling class). He was inducted into the America’s Cup Hall of Fame in 2001, but he’s joined many other halls, including the Inland Lake Yachting Association Hall of Fame in 2002. He’s sailed the San Francisco Bay and raced off the coasts of New Zealand, Australia, Germany, South America and Japan. Melges is a two-time Star world champion, a three-time 5.5 Meter World Champion, a five-time E-Scow National Champion, a seven-time Skeeter Ice Boat World Champion, and a three-time Yachtsman of the Year. Not that Melges was ever keeping track. You’ll also spot Melges among the who’s who in the yachting industry. He’s a member of the Lake Geneva Yacht Club, Chicago Yacht Club, Milwaukee Yacht Club, Texas Corinthian Yacht Club, and Little Traverse Bay Yacht Club. He’s an honorary member of the South Shore Milwaukee Yacht Club. This sailing master has also found success beyond the waters. Equally impressive as his sailing career is the family business, Melges Performance Sailboats, which was started by his father, Harry, and now is run by his own son, Harry III. The company designs and manufactures scows and sports boats for customers all around the world. Whether it was winning a regatta or teaching a youngster the finer points of sailing, Melges, now 86, has spent a lifetime advancing the sport of sailing as a competitor, teacher and promoter. Melges is engaging and entertaining in conversation. He rattles off accomplishments and dates like nothing. But he’s more at ease doting about his family than his own success. And he has stories. Plenty of them. Born in Elkhorn, Wis., Melges grew up on Delavan Lake, sailing boats designed and manufactured by his father, Harry Melges Sr.
“My father was just getting back on his feet after the Great Depression,” the younger Melges says. “He always had a big love of sailboats.” He was working for Bauvias Boat Company, which is where Gage Marine is located on Williams Bay. Young Melges’ first boat was a dinghy he learned to sail on Delavan Lake. He saved his money for two years to pay for improvements to the boat. Young Melges started sailing competitively at age 10. In 1940, he entered his first competition on Geneva Lake, where he finished fourth out of 16 boats. It was about this time that his family moved from Delevan to Lake Geneva. Harry Sr. went on to work for the Palmer Boat Co., in Fontana, building scows, a type of sailboat common around the lakes of Wisconsin. But in the early 1940s, war put a halt to boat sales for Harry Sr. He went to work for local businessman William Grunow, who had been raising chickens and shipping them in large quantities to Chicago. Chickens were in great demand during wartime meat rationing. In the mid-1940s, Grunow’s company was delivering seven semitrailers, filled with chickens, to Chicago every day. That same year, Melges and a friend crewed the company’s first boat in a regatta near Cedar Lake, Wis. Melges enjoyed the thrill of victory and it didn’t take long for others to notice he was good at it. Melges’ sailing career was put on hold when he was drafted into the Korean War in 1952. For the next two years, he learned artillery survey and fire control. When his unit wasn’t in danger, he and his fellow soldiers found time to play basketball, baseball and football in any open field they could find. He also found time to hunt pheasant, a hobby he still enjoys today. “We made the most of our time there,” says Melges, who earned a Bronze star for his military service. Gloria was a pretty good sailor in her own right. A native of New Jersey, she moved to Chicago with her family when she was 5. Her father, Alfred Wenzel, loved to sail. “I was practically raised on Lake Michigan,” says Gloria, who was 9 by the time she owned her first boat. The Wenzel family spent the weekends sailing Lake Michigan. Gloria and her younger brother, Alfred, raced mostly against the adults, since there were no junior activities then. “It was a wonderful upbringing,” she says. While Melges was away at war, Gloria earned her degree at Northwestern University and became a dental hygienist. She and her future husband wrote letters back and forth, and Gloria would often take the train to Lake Geneva, where she and Harry Sr. would sail together. “She fit in with my family pretty darn well,” Melges says. The couple married in 1954, a year after Melges returned home from war. They celebrate 62 years of marriage this year. For the first seven years of marriage, the couple sailed often, with Gloria joining Melges’ crew. As the couple’s children – Laura, Harry III and Hans – grew up, each developed a personal love for sailing. While the family was growing, so was Melges’ competitive spirit. At the 1964 Olympics in Tokyo, Melges won a bronze medal in the Flying Dutchman Class. In 1968, at the Pan Am Games, he won a gold medal, again in the Flying Dutchman. In the 1972 Olympics in Kiel, Germany, Melges and his team won a gold medal in the soling class. Equally as thrilling was being the winning helmsman on the America’s Cup yacht, “America3,” in 1992. “It was unbelievable,” he says. “No one could touch us.” Melges won more than 60 major national and international sailing championships during his career. Throughout his career, Melges has juggled the demands of competitive racing with those of the family business. Melges took over his father’s business in 1955. Melges Performance Sailboats is now run by Buddy’s son, Harry Melges III, who’s also a world-champion sailor. Buddy is chairman of the company and still comes in often, checking up on the daily activities. Melges Performance Sailboats designs, manufactures and sells superior-built scows and sport boats around the world. Their Melges 24, introduced in 1993, became one of the most successful launches in boatbuilding history, and today the company is the only builder of many inland lake scow classes, including the A, E, C, MC and the Melges 17. 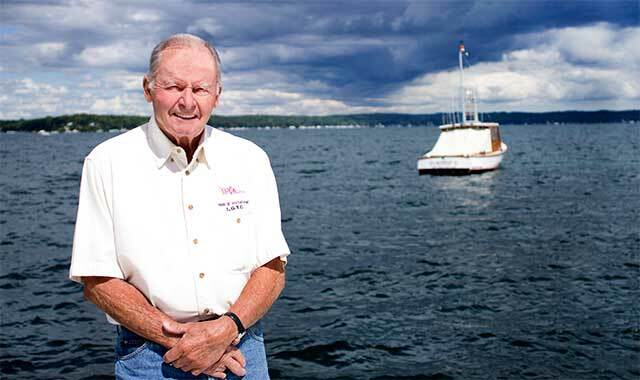 For years, the Lake Geneva Yacht Club and Lake Geneva Sailing School have served almost as a second home to Melges and his family. Melges was a student there in the 1940s and later taught courses. His children also grew up at the club. Last year, the Buddy Melges Sailing Center, a new 12,000-square-foot home for the Geneva Lake Sailing School and Lake Geneva Yacht Club, was unveiled. The center is the culmination of years of fundraising and planning to combine the school and club into one large space. It sits on eight acres of lakefront property, along with other buildings. The two-floor sailing center is stunning; the school has six classrooms located on the first floor; the Yacht Club upstairs includes a large dining and bar area, trophy displays and a deck overlooking the lake. The school teaches about 450 students each summer, including 100 adults. During the school year, the sailing school hosts practices for area high school sailing clubs. Melges visits the club almost daily. He greets staff and catches up on the latest news. He’s unassuming, though; you’d never know this is the man responsible for many of the awards and trophies in the display case. He and Gloria spend much of their time with their three children and seven grandchildren. Daughter Laura lives in Harbor Springs, Mich. Hans lives in Chicago, and Harry III in Lake Geneva. In addition to the boating business, the family owns car washes in Lake Geneva and Elkhorn. It appears the family’s sailing legacy will carry on. Many of the grandchildren have taken to the water; in fact, 14-year-old Harry IV recently won a Milwaukee regatta. While sailing remains Melges’ first love, there are other hobbies that consume his time. Melges is an outdoorsman, environmentalist and conservationist. He enjoys duck hunting and is a longtime supporter of Ducks Unlimited and other wildlife conservation groups, including Delta Waterfowl, a nonprofit organization whose mission is to provide solutions to conserve and secure the future of waterfowl hunting. Sailboats. Ducks. It doesn’t matter. The fire still burns for Melges. This entry was posted on Wednesday, June 29th, 2016 at 11:58 am	and is filed under Features, Top Posts. You can follow any responses to this entry through the RSS 2.0 feed. Both comments and pings are currently closed.